One year ago today Jake and I woke the girls up early so we could spend some time together as a family. I sat all three kids on the couch and I took a picture. If I close my eyes I can still feel that moment. I remember not being able to make eye contact with Jake because I knew....I knew he was thinking the exact same thing. If I saw on his face what I was holding back in my heart I wouldn't be able to keep it together. 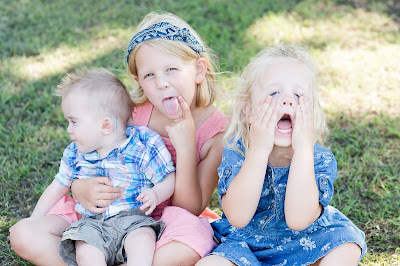 This might be the very last picture that we took of all three of our kids. We might come home with lonely arms and shattered hearts. We all might have to figure out how to do life on Earth without Dustin. We kissed the girls good bye. We got in the car and Jake drove. I sat in the back trying to not be crushed by the weight of our life. It was still dark out. The trees and flowers were all dormant, no signs of life at all. Only death! We didn't really talk. We parked. We checked in. We walked up to the Cardiac ICU and for 11 days we battled for Dustin's life. Then we got back in the car and we drove home. Before that day I didn't know that fear and joy could reside in the same breath, but they can. We pulled onto my favorite road, Old Annetta, and everything had bloomed. The trees had big, beautiful, healthy leaves. There were flowers sprouting in the fields. Life was everywhere. We were engulfed by life. We drove to the hospital there was death...11 days later we drove back home from the hospital and there was life. I didn't really see it then but lately I can't at all get this out of my mind; this image of death and life that God has placed before me. It's as if He wants me to know and proclaim that just as He brings back the trees every year....he brought back Dustin. And through this trial He saved my soul. One year later I am a new person. I am not the fragile woman who walked into the hospital. I've changed. Our trial has grown my faith and my understanding of who God is. I'm confident in the words of the Bible and the God that I have grown to respect, and love. This year has taught me to daily draw near to God and in doing so He has drawn near to us all. Today I am thankful! Thankful for a God who brings back the dead to life. Thankful for the trees that are sprouting leaves, and for Dustin who is very much alive. Thankful for my soul, it knows exactly where it will be when my heart one day stops beating. And I'm thankful for the pictures hanging on my walls that are full of memories from this year with all three of my children.